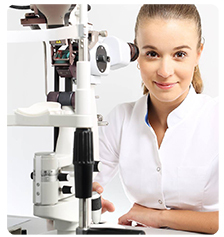 The Florida Lions Eye Bank Ocular Pathology Laboratory, located in Bascom Palmer Eye Institute, operates solely for the study of ophthalmic pathology material. The laboratory receives tissue from surgeries performed at Bascom Palmer, other sites in Florida and the Southeast United States, as well as from Central and South America. Over 2000 surgical specimens are processed each year including over 250 globes, and wide variety of conjunctival, corneal, orbital, lid and intraocular lesions. Additionally, the archive of glass slides, consisting of over 50,000 cases is available for examination, teaching and research activities. Additionally, in suspected cases of abuse and trauma, eyes are evaluated from medical examiners. The laboratory has access to immunohistochemistry, electron microscopy, flow cytometry, and molecular diagnostic techniques. All referred tissues are reviewed and processed completely free of charge, a tradition begun when the laboratory was founded in unique association with the Florida Lions Eye Bank. For submission of tissue, referring physicians may call 305-326-6356. One of only fifteen or so such laboratories nationwide, the Bascom Palmer ocular pathology lab is a comprehensive source of tissue evaluation as well as of teaching and learning. It is one of the busiest in the country and the only ocular pathology lab in South Florida. In addition to tissue evaluation in the laboratory, the eye pathology department trains ophthalmology residents in ocular pathology. This gives residents a clear understanding of what they see in the clinic when they evaluate eye diseases and disorders on a microscopic level. When residents examine specimens from a patient’s eye, they also may replicate a clinical examination to correlate laboratory observations with clinical observations. Tissues and slides are submitted by faculty members and physicians in the local community, the surrounding region, and elsewhere. The medical director and resident physicians process and evaluate these materials in the laboratory and promptly fax or mail a report to the clinician. An on-site collection of more than 50,000 specimens, including glass slides and paraffin blocks, is used for research and teaching.